We offer a full range of activities for all ages and levels. 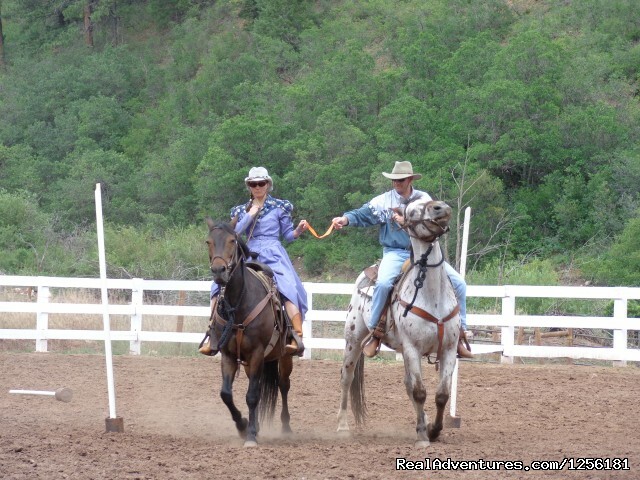 First and foremost is our horseback riding program for beginners to advanced. We match you up with the perfect horse and give you the guidance you need for rides on which you will learn something, be safe and have fun. Our rides are grouped by ability and type of ride desired. 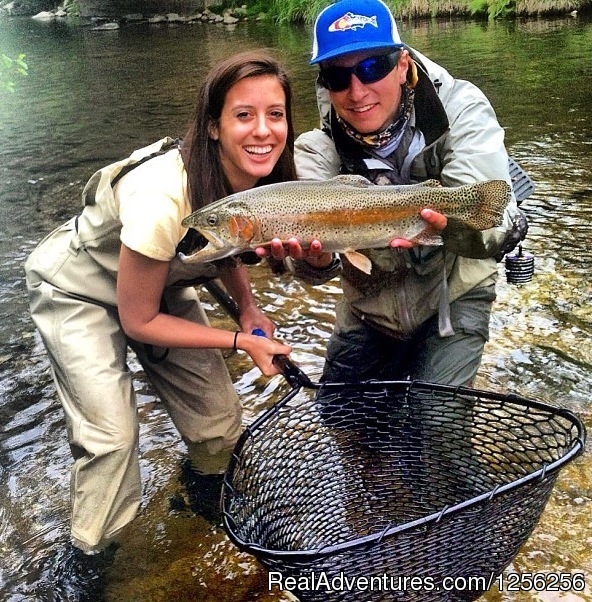 We also offer fly-fishing with instruction and fish not only on private stocked ponds, but private water on the Florida River as well as our permits for high mountain streams. The kids do most of their activities with their peers and at their level of energy. The friendships they form last a lifetime. 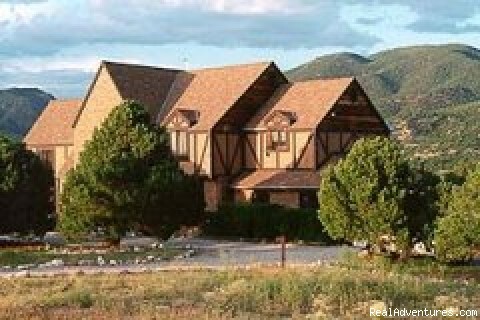 In addition to riding and fishing, we have shooting sports, hiking, swimming, rafting, evening programs such as an ice cream social, cook-outs, square dancing and hay ride to name a few. Of course, you are welcome to relax in our peaceful, beautiful scenery. The weekly stay progresses through the week. 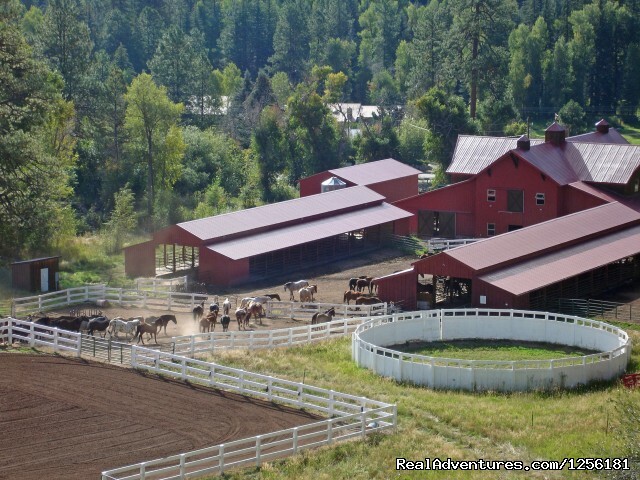 You start out with slightly shorter rides and finish the week with lunch rides and games on horseback. Begin your day with coffee on the porch watching the horses come into the barn from evening pasture and then move on to a full breakfast. 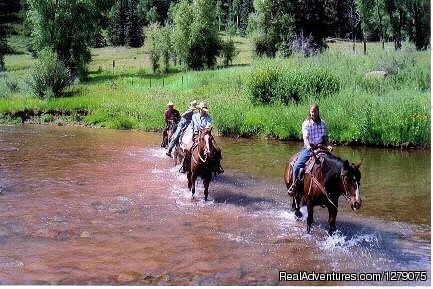 Then head down to the corral for your morning ride. 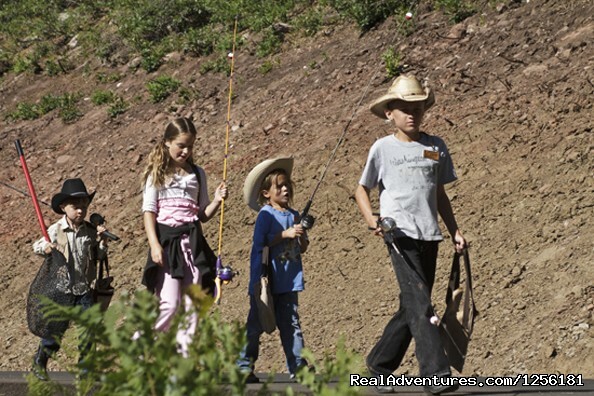 The kids will head out on a ride as well and return to a chance to fish before lunch. 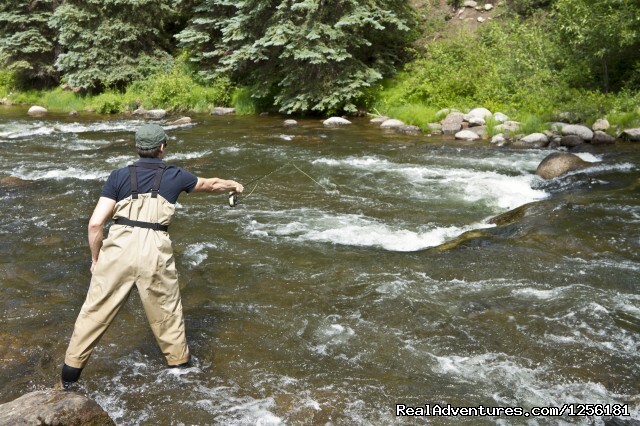 After lunch, the adults have an option of a fly-fishing clinic or another ride. 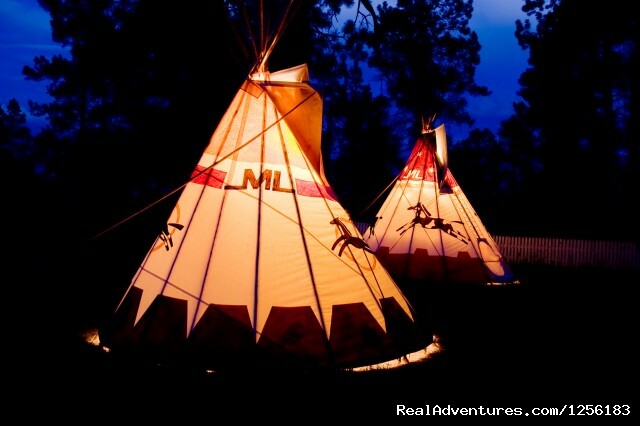 The kids will go on a ride and then head to the rifle range and/or archery range. Everyone meets by the office to catch a hay ride to a cook-out dinner. After dinner the kids go off with the hay wagon and play some games while the adults sit around a campfire listening to a cowboy singer. 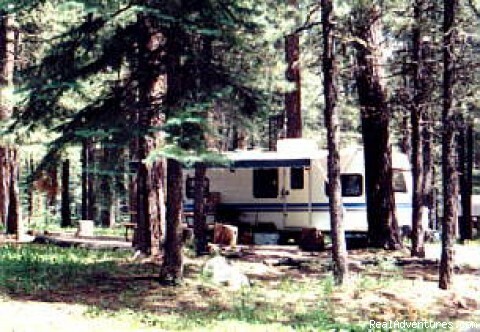 The next day, wake up to breakfast in the woods and then a ride or a hike. After lunch, you can have a massage, go riding or go to the trap range. 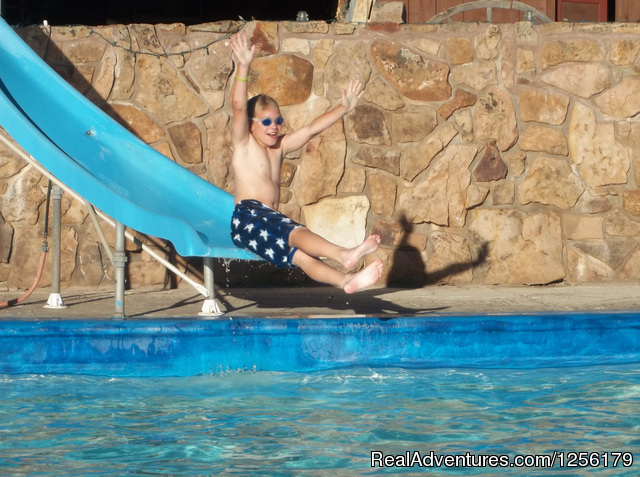 Meanwhile, the kids will ride and then go swimming to cool off. Each day offers new adventures as the week progresses. 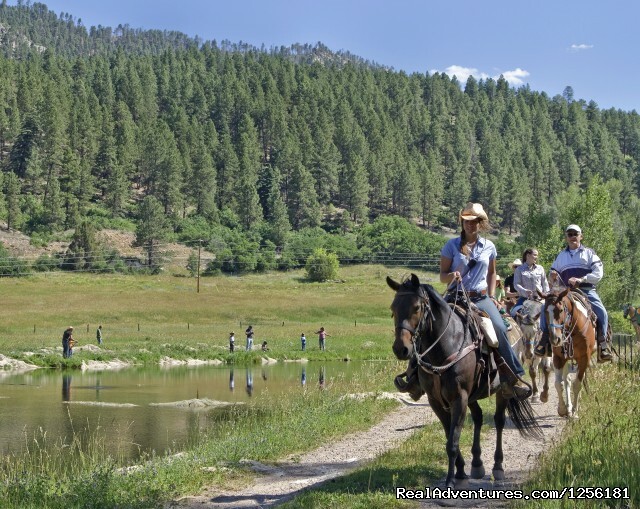 A dude ranch vacation is great for families, couples and singles. No one ever feels out of place. This is also a fantastic venue for a family reunion. There are plenty of opportunities for the family to gather together. 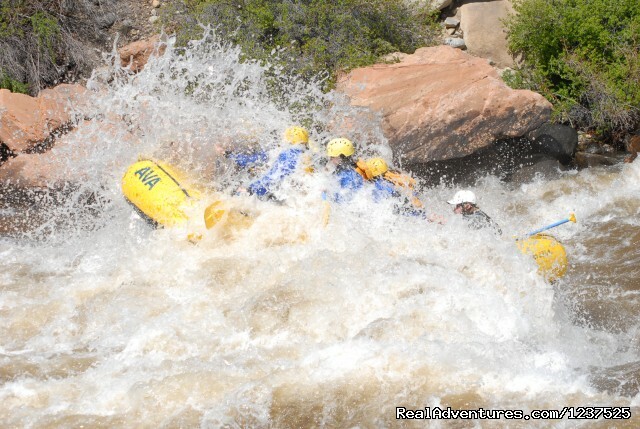 We have something for everyone's taste in activities. 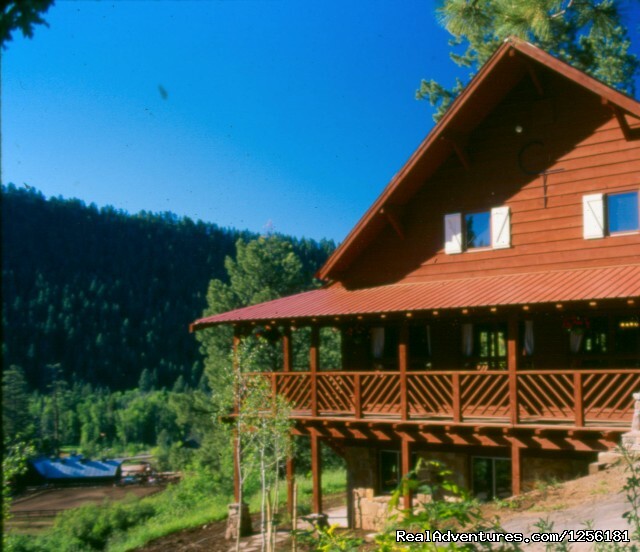 Our guests stay in cozy cabins, nestled in the woods. Each room has its own bathroom and porch as well as daily maid service. 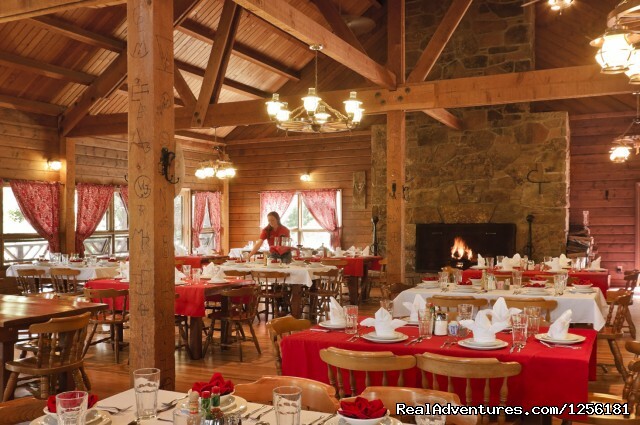 Our meals are served in the dining room or outside on special cook-outs. 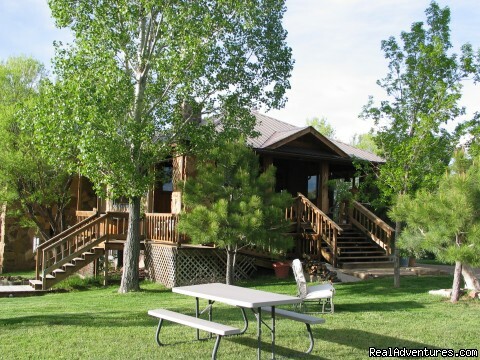 We have replaced all but one of our cabins (and that one got an interior remodel) in the past couple of years. 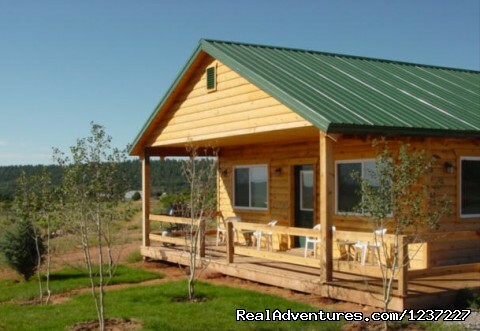 All the new cabins have a bathroom for every bedroom, living rooms and great covered porches on both sides of the cabin. The rooms are larger and more comfortable. We do not allow pets.....there are so many other animals on the ranch that strange pets do not fit in. While we welcome anyone of any age, our children's program begins at age five. Those under the age of five are just too young and small for our activities. Our stays run from Sunday to Sunday. We do offer shorter stays with a minimum of three nights, but the stay must begin on Sunday. 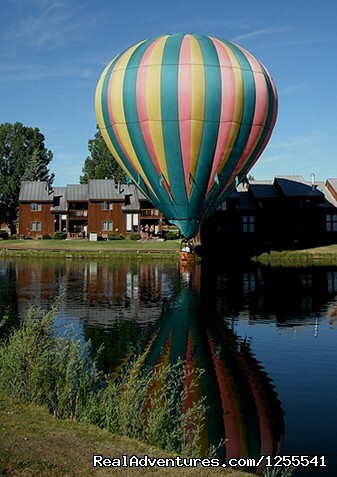 Our rates are based on occupancy of different types of accommodations. 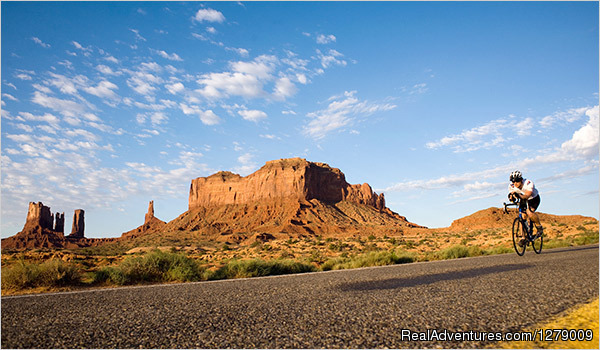 They include the accommodations, all meals, virtually all the activities and the gratuity. There is a 6.8% sales/lodging tax in addition. 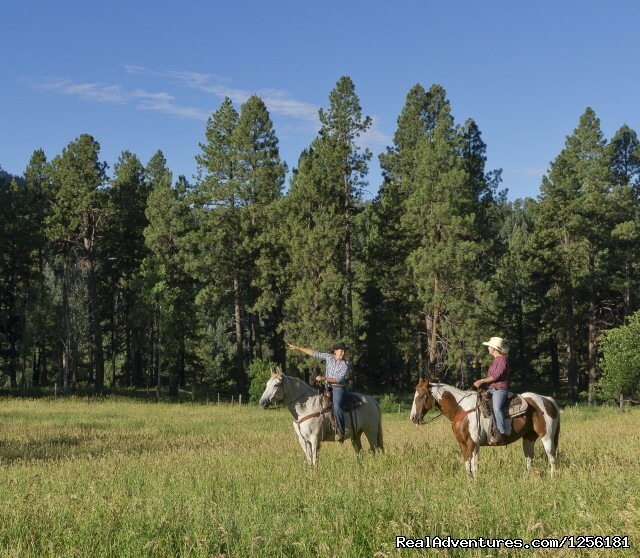 We do have just a few optional activities that carry an extra charge such as a morning of team penning with cattle, an all day guided trip to Mesa Verde National Park or an evening at a rodeo in Durango. Please give us a call or drop an e-mail for specific prices. We have a game room for time in between activities for the kids with a pool table, ping pong, foosball and air hockey. Above the dining room, we have a loft with over-stuffed chairs, another pool table and a computer, printer and wi-fi for the adults. It is a great place to sneak away for a quite read every once in a while. Next to the game room, we have an old fashioned soda fountain and a small "trading post" store. You can stop by for an ice cream soda or milk shake. You can also shop for sweatshirts, T-shirts and other ranch items as well as a few sundries. We offer a 15% discount for weekly stays for the first week in June (Beginning June 9th), a 10% discount the second and third weeks of August (beginning August 11th) and a 20% discount in September (beginning August 25th). These discounts apply to weekly stays only. Also, we have two popular specials. One is that the third child is free, so if you have a family of four and bring a relative, a friend or another child, there is no charge for the third child. OR if you bring another family, everyone receives a 15% discount. Again, these specials apply to weekly stays only. The discount and specials may not be combined. We will pick out the best option to suit your situation. General Manager for Colorado Trails Ranch. Been with the ranch since 1966.